What is open during Chinese New Year 2018? 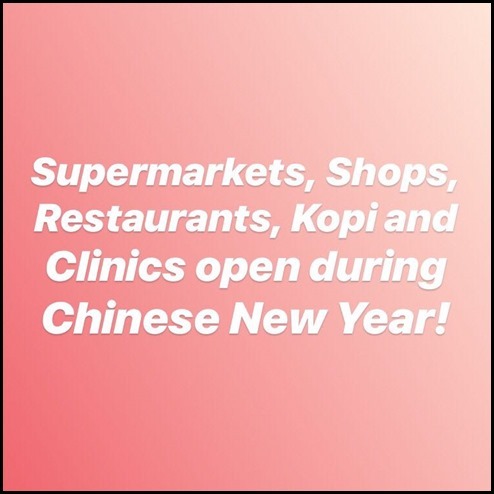 Read What is open during Chinese New Year 2019 here! 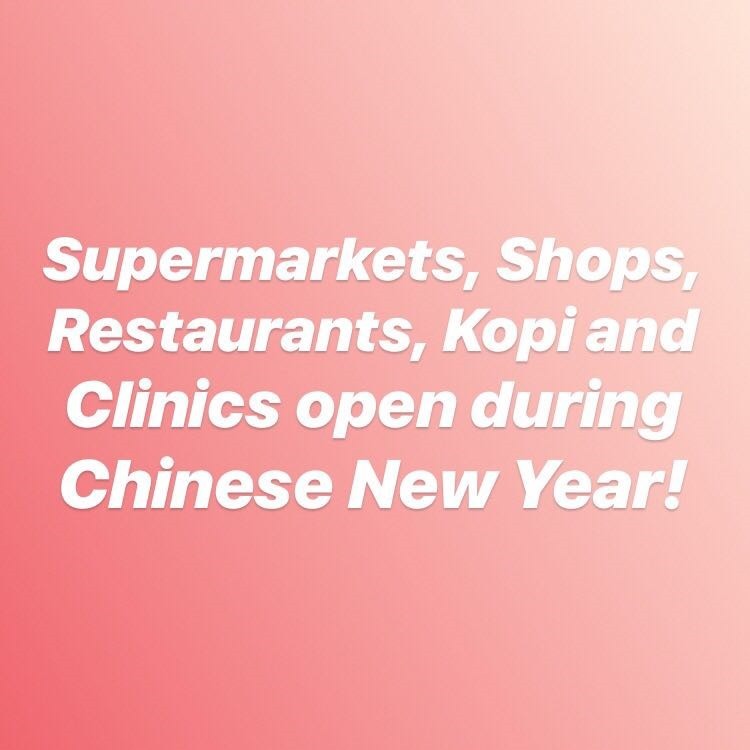 Here’s 365days2play’s annual list of supermarkets, malls, clinics, food courts, and kopi/cafe places that are open during the CNY period! Hope you find it useful. If the supermarket or shopping centre in Orchard road is not listed here, it’s because the information is not available (yet)! You can also check the 2017 guide and 2016 guide for reference. wishes all a prosperous and wonderful Chinese New Year 2018! CNY Eve (15 Feb) – 81 FairPrice stores to operate 24 hours. All to open till at least 5pm. 1st Day (16 Feb) – 90% of stores open till at least 5pm. CNY Eve (15 Feb) – Most stores close at 7pm. MBS until 11pm. Closed from 16 – 18 Feb. Business as usual on 19 Feb. Read notice here. 1st Day (16 Feb) – Half the outlets are open, on average till 7pm. 2nd Day (17 Feb ) – Many outlets open, till about 7pm. 1st Day (16 Feb) – Most outlets closed. 2nd Day (17 Feb ) – Most outlets closed. CNY Eve (15 Feb) – Selected CBD outlets close 5pm. Orchard / heartlands open late. CNY Eve (15 Feb) – All open until 5pm except Capitol Piazza until 10pm. Singapore Zoo – Open every day of the year! Night Safari – Open every day of the year! River Safari – Open every day of the year! Jurong Bird Park – Open every day of the year! List will be updated as and when I receive more information. 365days2play Fun, Food and Family Blog wishes a Happy Chinese New Year to all! HUAT AH! Read more of my food and travel reviews here! Posted in 1.1 Hotel Restaurants, 1.2 Restaurants, 1.3 Casual Restaurants, 1.4 Cafes, 1.9 Others, Food, What's on? Tags: Cafes in Singapore, Chinese New Year, Explore Singapore, Explore Singapore - See and Do, fast food, Local eats/Hawker food, Restaurants, Singapore, supermarket, What's on?